Tring Athletic in action earlier this season during another victory. Athletic have now opened up a two-point lead at the summit after main title rivals Biggleswade FC drew 2-2. Biggleswade have two games in hand so are still favourites to land the solo promotion spot and title, while Hadley are still in the mix, two points adrift in third by virtue of an inferior goal difference . Tring had a good start on Saturday and were 1-0 up on nine minutes thanks to centre back Carl Mensah, when he neatly headed home into the corner from a Lee Stobbs free-kick. The visitors held that advantage to the break but the game went haywire after the break with four goals during the first 20 minutes of the second period. Town equalised seven minutes after the re-start when Athletic lost the ball in midfield and Paul Marks took advantage to stride through and calmly slot the ball past keeper Connor Sansom. Edgware’s defence was showing signs of brittleness and two minutes’ later they allowed Athletic to re-take the lead when James Verney struck a lovely shot from 20 yards that the keeper could not keep out. The topsy-turvy trend continued when Athletic gave away a penalty just three minutes later. Richardo Alexander-Greenway stroked the ball home to grab Edgware’s second equaliser. The entertainment for the spectators was not yet over and Athletic went 3-2 ahead with a superb strike from George Ironton. Receiving a short corner, Ironton evaded a challenge and then cracked a magnificent shot from the left-hand corner of the box that arrowed into the top-right corner of the net. It was a goal of the highest quality for his eighth of the campaign. 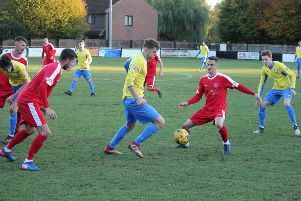 Tring then recovered their composure and dominated the last quarter of the game, finally putting it to bed in the 85th minute when Jon Clements slotted the ball home to round off the scoring. This Saturday Tring have their penultimate league game when they visit bottom side Cockfosters, but before then were due to visit Berkhamsted FC in a local derby last night (Tuesday) as the Gazette was going to press for a place in the Herts Charity Shield final. 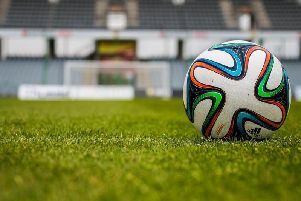 Rivals Biggleswade FC were to visit bottom-but-one side London Tigers last night, before travelling to 14th-placed Harpenden Town on Thursday night and relegation-troubled Stotfold this Saturday.